*Like CowParade™, participants are encouraged to customize their monuments to represent the unique attributes of their locale. Americans like to keep things simple and direct, so here it is: they rule. For the simple reason that they (the ruling class) have all the money. 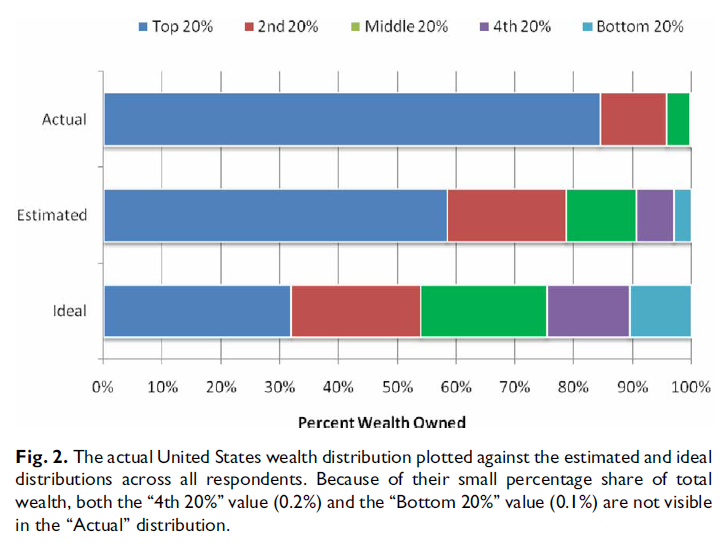 The top 5% of US citizens own almost 2/3 of the country’s wealth, or 63.5%. Compare that massive share to 12.8% for the bottom 80% — that is, “the rest of us,” as Rhonda Winter puts it in the excellent article from which this pie chart is taken. The whole point is, though, that very few people go any further, because very few people have any idea how unequal the United States has become. We are, apparently, a nation of idealists, which is a good thing. We are also, however, a nation of blind idealists, which is a pretty bad thing across the board. A couple of psychologists named Norton and Ariely did a study comparing people’s ideas of what inequality is and what it should be with the actual facts on the ground. Anyone interested in creating a more progressive political order should turn up the attention meter right here. It turns out that in strictly economic terms, Americans are not full-on egalitarians, but on average, they think everyone should have at least a piece of the pie. They think the top 20% should have around 30% of the wealth, the bottom 20% should have around 10%, and so on according to a smoothly sliding scale. They realize it’s not true, of course, and they estimate that the top 20% may in reality be holding over half of the spoils. What they do not realize is not only that the top 20% swallows a whopping 85% of the pie (with, of course, the top 5% taking the lion’s share of that). Even more crucially, they also do not realize that the bottom 40% — what economists call the 4th and 5th quintiles — are for all practical purposes off the chart, simply invisible, because they (or maybe “we,” depending on who you are) own only 0.2% and 0.1% of the wealth respectively. Let’s put that in plainer terms. Almost half the people in this country get virtually nothing from the deal. I would draw two conclusions from this psychological study. 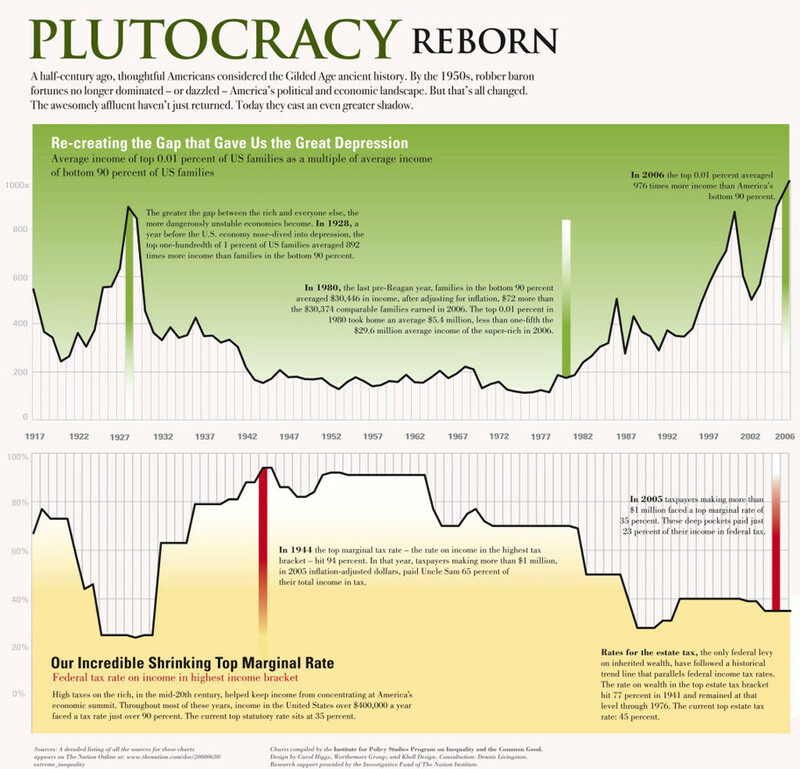 The first is that the United States is ripe (and even wildly overdue) for a political revolt against the plutocracy. No doubt you will reply, “But that’s exactly what the Tea Party is calling for!” And so they are…in part. But every day the newspaper shows that most of the Tea Party rage against Wall Street is being successfully channeled into rage against Big Government, while the resentment against taxation acts to preserve the massive tax cuts that for the past thirty years have overwhelmingly benefited the super-rich. An atavistic fear of Obama’s black skin and a constant barrage of ideology from Fox News and the Koch brothers’ think tanks and political action committees seem to be doing the job just perfectly for the plutocracy. However, as unemployment rises even while the profits of the super-rich increase, I am not sure this situation can go on indefinitely. Beware the day when right-wing rage from the red-state grassroots finds a serious political translation, because even if it castigates the rich, the sound of that vengeful and nationalistic voice will not be agreeable to your ears. This leads to my second conclusion. We organic intellectuals on the Left — and this “we” is finally serious, I am speaking to those who might actually read this site — are not doing our job. We have no Tea Party. We are for equality, social democracy, outright socialism, a workers’ revolution, all power to the multitudes or whatever, but we are not getting the word out to the left-of-center masses. We have the information, thanks to studies like the ones I have been quoting, but we are not able to turn information into action, not even on the simplest of demands: tax the rich and control the banksters. Yet these very simple demands could lead directly onwards to more progressive policies that we are all support, such as cutting the military budgets, achieving universal health care, restoring public education and replacing the prison economy with job-producing community development programs. It’s clear that the Dems will not do these things, because in their vast majority they belong to the upper 5%. So we have to create the conditions for a political revolt from the grassroots, and we have to do it in a way that is not simply cooptable by smooth-talking people like the current president. Here’s one idea, only one among many. Copy the image at the top of the article and take it down to your local button-making shop. Pick a fat button and ask them to put big letters around the bottom that say, “Eat the Rich!” Get a whole bunch of those buttons, wear them, distribute them and start talking to whoever you meet about the facts and figures that are discussed in this blog post and in any of hundreds of readily available left-of-center publications. Start an open, public, regular meeting group to discuss those facts and figures and many other things that make the present what it is. Do your job as a public intellectual, educate the people around you and learn from them, build grassroots awareness and rage wherever your roots happen to be. Hold the course in that direction as the unemployment figures rise, and make contact with as many similar groups as you can find. All of this will lead in very interesting directions. Keep it up and maybe soon we’ll all get together for a big ‘ole political banquet and finally eat the rich!